Land ho! This week on Cinema Sips, I’m mixing business with pleasure by featuring a movie and drink that are factoring strongly into my current vacation to Disney World. As any true Disney fan knows, the very best thing in the Magic Kingdom is the Dole Whip at the Aloha Isle. A creamy soft-serve pineapple concoction that I always get floated over pineapple juice (aka- the Dole Whip Float), it’s something I dream about on hot summer days. Just thinking of that sweet, tart pineapple flavor makes my mouth water. This amazing snack is found just beside the Swiss Family Treehouse, a recreation of the island treehouse featured in this week’s film Swiss Family Robinson (DVD/Download). The bench nearby will be my home-away-from-home for a few days, while I scarf down enough Dole Whip to put myself in a diabetic coma. Swiss Family Robinson is based on the novel by Johann David Wyss, and it came out during what I like to think of as the Golden Age of Disney live-action films. In the 1950’s and 60’s Disney released such gems as 20,000 Leagues Under the Sea, Pollyanna, Darby O’Gill and the Little People, and The Parent Trap. Oh, to be a kid back then! (I was stuck with Angels in the Outfield ). In Swiss Family Robinson, The Robinson Family (father, wife, and 3 sons) gets shipwrecked on an uninhabited island in the South Pacific after a tedious pirate battle. They manage to salvage important things like livestock, tools, two Great Danes, and a pipe organ (how could you possibly survive on an island without one of those??). The pirates make a few more attempts to seize the family, but in the meantime the Robinsons set about crafting a pretty awesome treehouse. It’s got ladders, curtains, the aforementioned organ, a dining table, separate bedrooms, and even a watermill. Later on a young lady arrives, setting off a tepid love triangle between the middle and eldest sons (team Ernst all the way!!!) and the youngest son manages to pull a Kevin McCallister and booby trap the island against future pirate invasions. If they could re-make this with Joe Pesci and Daniel Stern as pirates, my life would be complete. The following drink recipe was given to me by a very wise Disney employee years ago, after I went on and on about how much I love Dole Whip. My husband even surprised me with several pounds of dry Dole pineapple mix so that I could attempt it at home, but alas, it lacked the creaminess that you get from the machine. Over the years, I’ve found that using pineapple sorbet yields an excellent result, so this week, while watching The Swiss Family Robinson, break out the blender to make a Dole Whip Dream. Blend all ingredients in a blender until smooth. 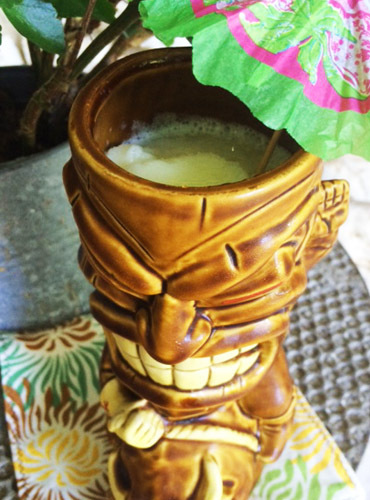 Pour into a tiki mug and enjoy with a straw and a tiki umbrella. It’s worth noting that Disney’s Polynesian Resort now has a Dole Whip cocktail on their Trader Sam’s Tiki Terrace menu, called the Spikey Pineapple. Of course I had to taste test it (just in the name of due diligence) and I can assure you all that my version is better. If you can’t make it to the Mouse House this year, do the next best thing by watching this movie full of island adventure and shirtless young men, and mix up a VERY tasty Polynesian beverage. Cheers! Posted in Action/Adventure/Heist, Classic Films and tagged Aloha Isle, Disney World, Disney's Polynesian Resort, Dole Whip, Dole Whip Cocktail, Dorothy McGuire, John Mills, Magic Kingdom, Spikey Pineapple, Swiss Family Robinson, Swiss Family Robinson Treehouse, Trader Sam's Tiki Terrace. Bookmark the permalink.